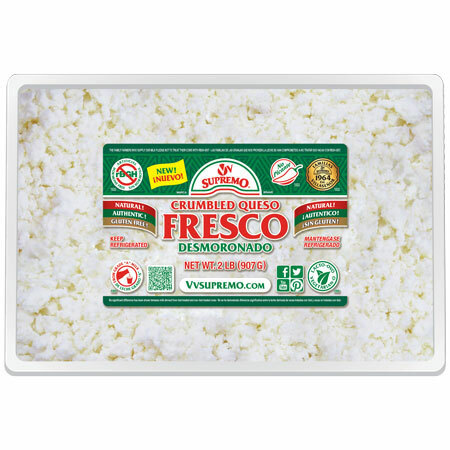 Fresh cheeses are essential in authentic Mexican cuisine and perfect for a multitude of menu items across ethnic backgrounds. Ours are crafted from grade “A” whole cow’s milk with no artificial rBGH hormones, additives, or preservatives. We can supply all your needs from crumbling to searing with a variety of choices. FLAVOR PROFILE: Very mild with bright, fresh cream flavor. Lightly salted. CHARACTER & TEXTURE: Soft body, easy to crumble, can be cubed. Softens with heat, but does not melt. 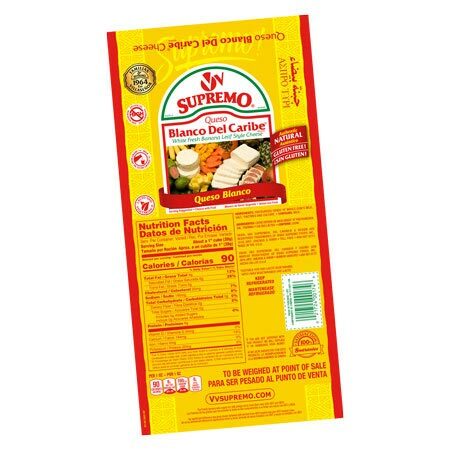 SUGGESTED APPLICATIONS: Typically crumbled over soups, salads, beans, tacos, tostadas, nachos, or used as a filling for enchiladas. Can also be cubed for salads, soups, and cheese trays. Will sear on a non-stick surface. CHARACTER & TEXTURE: Soft body, pre-crumbled. Softens with heat, but does not melt. 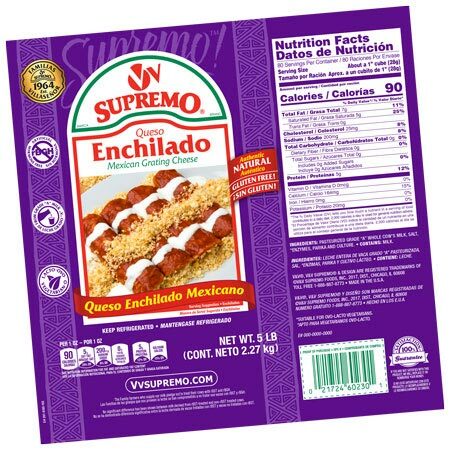 SUGGESTED APPLICATIONS: Typically crumbled over salads, soups, beans, tacos, tostadas, nachos, or used as a filling for enchiladas and stuffed peppers. FLAVOR PROFILE: Mild with fresh dairy notes and subtle paprika taste. Lightly salted. 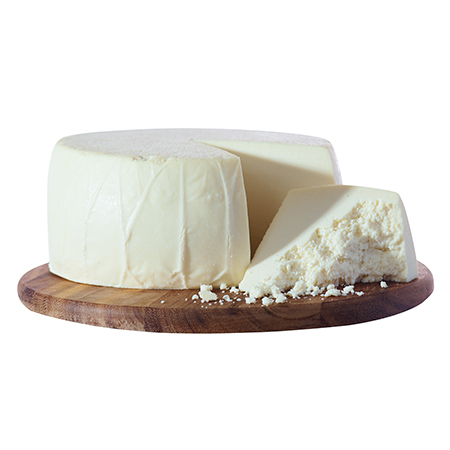 CHARACTER & TEXTURE: Slightly firmer than our Queso Fresco with a bright orange hue. Can be crumbled, grated or cubed. Softens with heat, does not melt. 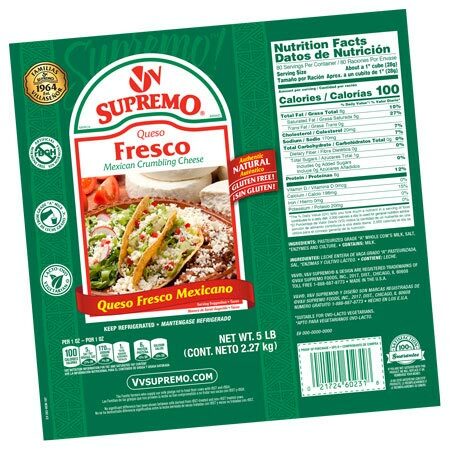 SUGGESTED APPLICATIONS: Grate or crumble over soups, beans, tacos, tostadas, salads or nachos. Perfect as a filling for enchiladas and whole peppers, such as poblanos. Cut in cubes and serve with any accompaniments desired. FLAVOR PROFILE: Mild with rich, fresh cream flavor. Lightly salted. CHARACTER & TEXTURE: Smooth texture-for slicing or dicing. Curdlike, with a “squeak” to the bite. Softens with heat, but does not melt. SUGGESTED APPLICATIONS: Traditionally eaten with tropical fruits or on snack platters with crackers, guava paste, and sausage. Can be enjoyed cubed or sliced with any fruit. Great for sandwiches, salads, and cheese trays. Ideal for searing.